How pretty is this dish?? Now that we’re in to March, the month where Spring makes it’s appearance on the calendar, I’m hoping for a speedy turnaround to the cold. Although my cats would likely argue for the continuing need for cozy, warm lap snuggles, I argue for lighter, greener, and crunchier. The current issue of Eating Well magazine has a section on bowl dinners- which is quickly becoming ‘the thing’ throughout Blogland to pile everything in a big, wide bowl- and the very first recipe listed was this Tuna Tataki Quinoa Bowl, of which I had everything on hand to quickly put it together. I’d recently found a 4-lb bag of organic Red Quinoa at Costco, and mixed it 50-50 with white quinoa, adding coconut milk, water and turmeric to create a deeply colorful option that added a lot of vibrancy to the plate. Er. Bowl. A can of Wild Planet Albacore tuna was used in place of fresh, marinating it in the same pungent and tasty broth. Outside, the wind was really howling, once again. The sky shone a deep blue and the feigned warmth of the sun lulled me in to disbelief over the current state of the air outside. The lime juice and ginger lifted a fragrant scent, and I fished around in the drawer for my julienne peeler, scrubbing down carrots and keeping an eye on the simmering quinoa on the stove. Thin strips of carrot and cucumber dropped to the cutting board under my hands. Even before the quinoa finished cooking, my meal was ready to put together. After piling everything artfully in the bowl, sprinkling it with a bit of nori powder and taking a few photographs, I stirred the ingredients together with a fork and sat down. It was light, delicious, and really satisfying, with crunchy texture and bright, bold flavors. I love lime juice and ginger together, and although I’m sure a fresh tuna steak, or even sushi-grade salmon would have added a lot more flavor, the alternative was still delicious, not to mention so much easier and convenient. One note on preparing quinoa: Eating Well lists, as many other recipes do, to cook quinoa in a 2-1 ratio of liquid to grain. In my experience, this makes for a very mushy and tasteless end product. Quinoa shouldn’t be mushy when you eat it; it should retain it’s shape, be toothsome but not crunchy, and you should be able to taste it’s texture. I have always cooked one cup of quinoa to 1-1/4 cups of liquid until all is absorbed, then remove the pan from the heat to sit for 10-15 minutes. It always comes out just fine. In a small saucepan, combine the coconut milk and water and bring to a boil. Rinse the quinoa well in a wire mesh strainer and add to the pan with the turmeric, stirring to combine. Bring back to a boil, reduce the heat and cover, allowing to simmer gently until the liquid is absorbed. Remove from heat and let stand for 15 minutes. While the quinoa is cooking, whisk the soy sauce, lime juice, ginger and chili garlic sauce together and add the tuna, breaking it in to bite sized pieces. Stir to coat and set aside. With a julienne peeler, or a sharp knife, slice the carrot and cucumber (minus the seeds) in to thin strips. 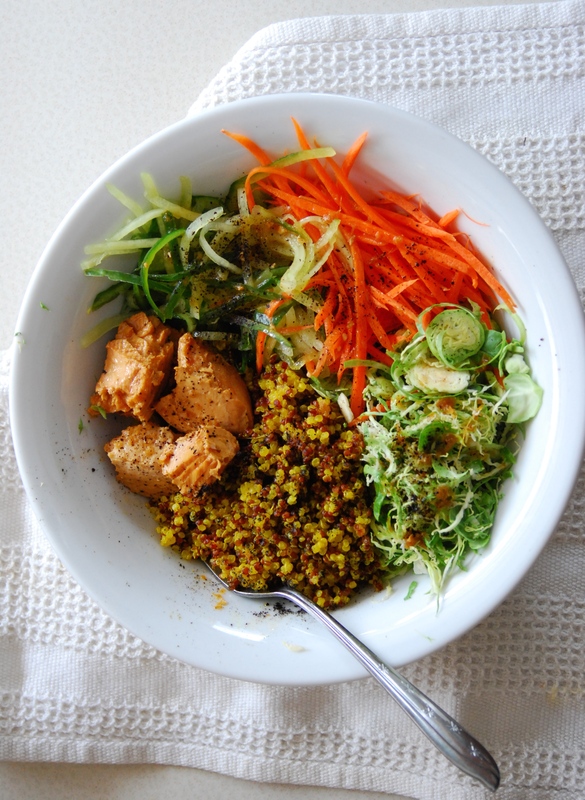 When the quinoa is ready, place about a half cup in a large bowl and mound the tuna, carrot, and cucumber around it. Drizzle with a bit of the marinade and sprinkle with the pieces of Nori. This recipe made two sizable meals. *- Coconut milk can be very thin, or very thick depending on the brand. The particular can I used this time was really thick and flavorful, but had I used it alone to cook the quinoa it would have never worked. I mixed it with water until it was thinner, but if you have thin enough coconut milk, you may be able to use it straight without adding water. Ah – yum!! You are making me and my 7 yo hungry! starring this recipe – will definitely be making this soon! 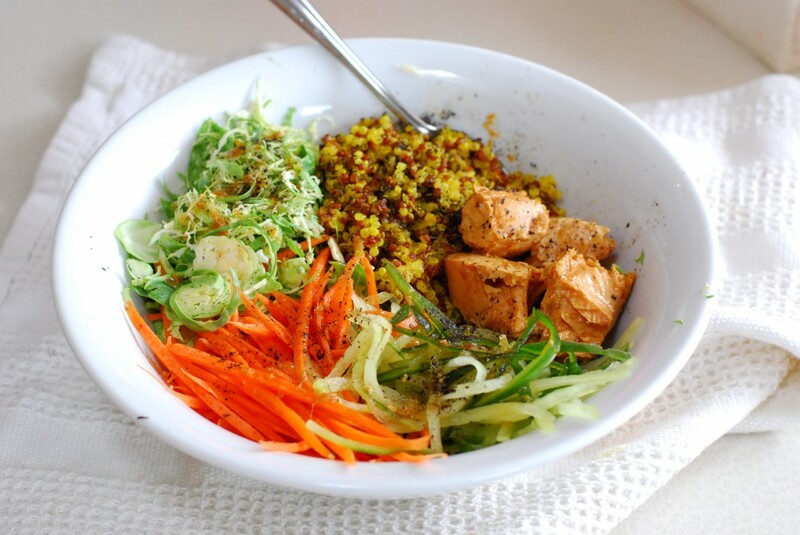 This bowl of yumminess is just gorgeous. I want it for lunch!